While SOO is demonstrably fixated with scapegoating refugees, it is a short step between anti-homeless hatred (veiled as “concern” for drug users who “need treatment”) and fascist ideas that a strong state or, lacking that state, far right mobs, must correct decadence, drug use, and racialized, “multicultural” threats to the white family that forms the heart of the Canadian nation. 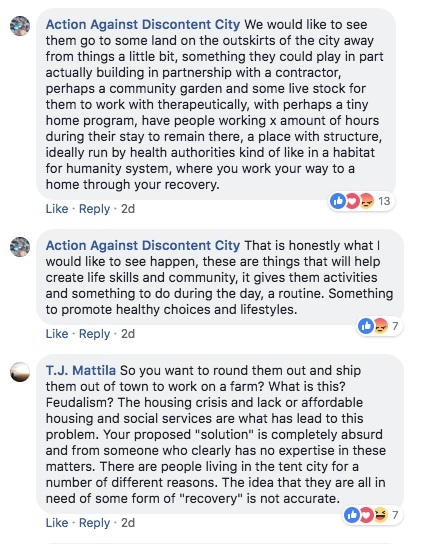 Action Against Discontent City declares that they would like to see Discontent City’s homeless residents relocated to an institutional compound in the “outskirts of the city”, where mandatory labour would “promote healthy choices and lifestyles”. Their attempt to spin the internment of marginalized people as a positive, humane, and necessary moral strategy comes straight out of a fascist playbook. The reality that Canada itself is a white supremacist state makes calling on the government to quash the far right untenable. Nowhere is this clearer than in Nanaimo, where the City’s own fascist tactics have emboldened both vigilantes as well as the Soldiers of Odin. Openly attacking, threatening, and hating on homeless people is not a fringe phenomenon here—it is legitimized by the City’s very tactics and reliance on a narrative that paints the predominantly Indigenous homeless population as a threat to mainstream society and therefore deserving of punishment and death. However, the City is still bound by the legal system, and must first justify its case for displacement in the courts, against the argument from homeless people that their Charter rights are being violated. The Soldiers of Odin and the bigots that ally with them are dangerous because they offer mob action to normalize and actualize the City’s intentions to smash the camp. In our view, SOO is not primarily here to physically attack homeless people, they are here to recruit the portions of the public that hate homeless people and will therefore be delighted by the fascist rhetoric of the far right. Picking up some garbage along the way only serves to help them dodge critiques of their hateful beliefs. We cannot rely on the state to push back the far right. The mythology of white supremacy is compelling to people because it is already unexceptionally woven into the fabric of Canada. What is dangerous and remarkable about this moment is the degree to which fascist currents have become normalized in Nanaimo, as a result of the actions of the City, the RCMP, and SOO and its allies. Appealing to the same government that represses and bullies homeless people to protect them from groups that align with the government’s own policies is naive and misguided. Homeless people in Discontent City have asked for RCMP support to protect them against vigilante attacks and the police have done nothing. The RCMP and City of Nanaimo have stood back and watched while far right vigilantes have expressed hate and practiced harassment and violence, gaining experience and confidence that resulted in their open rally with Soldiers of Odin on August 5th. The only time the RCMP have showed to protect anyone at camp has been at the Soldiers of Odin march in order to protect, in the words of an officer to a camp organizer, “both sides.” Homeless people are criminalized, anti-capitalists and anti-fascists are character assassinated and harassed on social media – the government protects the Soldiers of Odin. Our tactics must be to meet fascists, head on, where they are: to self-defend communities under attack, to organize counter-rallies to their actions, to openly and unequivocally name and denounce white nationalism where it appears, and to politicize the very people whom far right groups seek to recruit by offering them real, transformative alternatives to white supremacy.